I do not get to withdraw formally from SFWA because they did not realize I was a member…but I ran John’s membership for years (except for the voting. He did that.) And we both agreed to leave before John withdrew. I am not like John, who doesn’t pay attention to worldly things and whose only regret about dropping out of SFWA will be that he can no longer write funny stories about visiting the secret SFWA mansion in Pennsylvania. I adored it. I dreamed of joining for years. I carefully waited and planned, striving to earn the right to be a member. The only reason I was not a member was that John joined first. For me to join would have been double the money for the same services. They have a joint membership now, I believe. I had been planning to ask to join this summer when his membership came due. But now…I am abandoning that dream. An organization whose job is to represent people who write (among other things) about chain-mail bikini clad gals cannot decide to object to chain-mail bikini clad gals. Bikini girls might be right. They might be wrong. 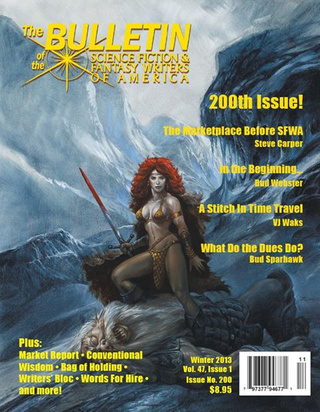 The job of SFWA is to represent science fiction and fantasy writers…including those who write or paint bikini-clad gals. Any given SFWA member can go out and refuse to buy such books. They can blog against such books. They can try to talk readers out of reading such books. If readers don't buy them, believe me!, SFWA authors will stop writing them. Must do so without complaining. Or must not be surprised when the authors it has stopped representing depart. Obviously, this is not about one cover…or even the loss of my favorite bulletin feature…but I thought this issue summed up the problem simply and clearly. If a professional writing organization decides to uphold any social agenda whatsoever, they turn their back on the members of their organization that do not support that particular agenda. Worse—this is speculative fiction—they turn their back on those who merely wish to speculate about what happens if you don’t support that agenda. In other words, by dabbling in politics—even something as simple as decided that a half-clad girl is sexist—they stop supporting science fiction. So, it is with great sadness that I must announce that I shall not be applying for membership in this group that I have so long loved. Alas, now I shall never have my long-awaited chance to spend a weekend in the present of the greats of the field at the secret SFWA mansion.